Down with 420? Well, there's an app for that. Zynga's hit game, FarmVille, lets players grow and harvest a variety of crops, like soybeans, corn and tomatoes. 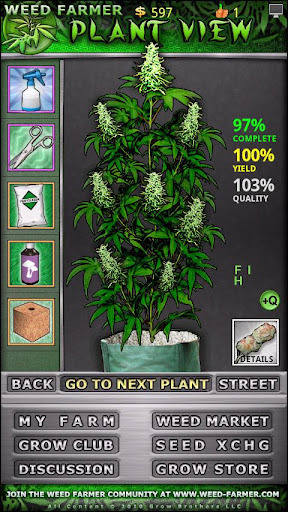 If that sounds boring, there's Weed Farmer, the online marijuana growing game currently available on Android. We'll stop short of saying it took the world by storm, but with 2,691 five-star reviews and nearly 80,000 downloads, the masses have spoken. We noticed it trending on Android, where it's the 23rd paid game. Curious, we did some investigating and found a whole bunch of marijuana-themed games that transform the Marketplace into a virtual Amsterdam. Thing is, these titles go far beyond the woefully simplistic and gimmicky smoking and farting apps that flooded the marketplace and even the iOS App Store over the years. Weed Farmer, for instance, lets players grow 30 different strains of cannabis, expanding their operation from a tiny closet to a huge warehouse. 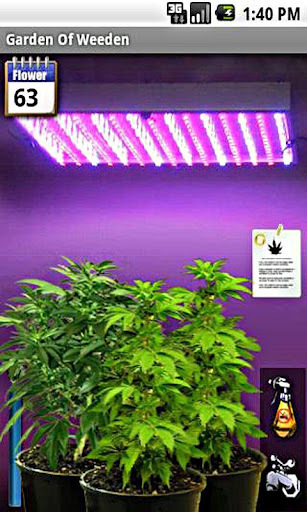 Throughout the growing cycle, they'll need to carefully manage lighting, ventilation, water supply and hydro pumps while figuring out ways to ward off bugs and fungus. Even more surprising is the social aspect. Not only do players chat live with fellow growers to share tips and claim bragging rights, but they can also climb the online leaderboards to lay claim to "wealthiest" or "most skilled" grower. The developers at Grow Brothers even hold in-game holiday events. Animal Crossing, eat your heart out. Meanwhile, rival game Garden of Weeden features six strains, including White Widow, Blue Crack, Acapulco Gold and Purple Urkle. Once again, it's all about interacting with others, as Gooey Web Solutions allows live chat and opportunities to set up deals to sell digital weed with other players. Worried about virtual 5-O. Don't, because as it states on the game's Android page, "All completely LEGAL from the privacy of your own phone!" Of course, if all this micromanagement sounds like actual work, you can always kick back and Smoke A Bowl; that's the game's official title, by the way. The folks at FDP Games supply three water bongs with authentic bubble noises, nine unique pipes, four lighters and even microphone and gyroscope support, where you're able to inhale and dump the bowl, respectively. Ah yes, and be sure to blow out with short breaths to produce smoke rings. 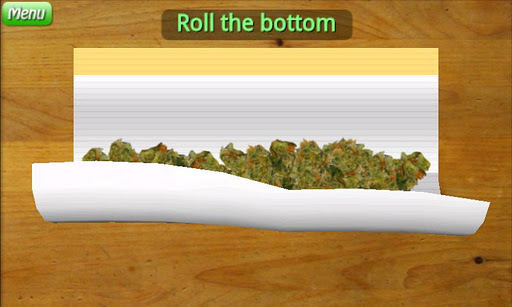 The same developer also released Roll A Joint, a game where players proceed to do just that, using the touch screen to choose a bud from a bag, break it up, carefully (we said carefully) place it onto some paper and roll that sucker, remembering to pinch the ends. Then they smoke it through the Android's microphone. 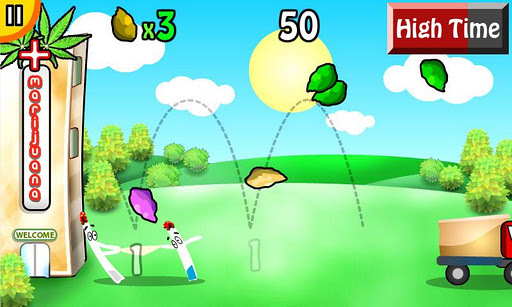 Finally, we stumbled across Weed Bounce from developer Lazy Bud. The goal? 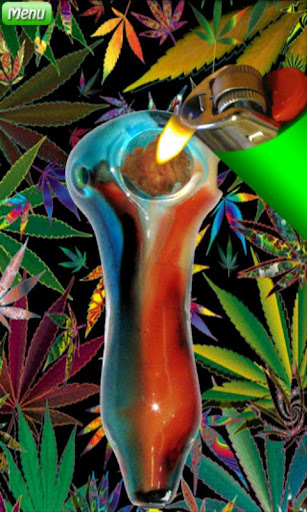 Rescue weed buds from the marijuana shop and enjoy some "High Time." What do Android customers think? They're against glorifying drugs, right? There would have to be a bunch of people upset at these games and the fact that kids can access them, yes? Not exactly. You'd think there'd be folks not into the drug culture, but all of the negative reviews seem to do with the gameplay or a stability issue. Of course, we don't mean to single Android users out, nor do we encourage actual drug use; seriously, just say no. If anything, this is an example of why Google has a leg up on Apple in the open platform department. On the flip side, perhaps this is why so many people prefer Apple's stricter content rules. Search for "weed" on the App Store, and you receive 114 apps, many of which have nothing to do with reefer. Performing the search on the Android Marketplace, on the other hand, brings up at least 1,000. Remember that, next time a "hip" iPhone user takes a shot at Android...or not. Perhaps you should keep this to yourself.